(NaturalNews) A somewhat unusual and long-forgotten healing protocol that dates back thousands of years is making a major comeback in the modern day. Advocates say it can help dramatically improve sleep quality, boost energy levels, improve eyesight, enhance endocrine health and, perhaps most interestingly, "decalcify" the pineal gland. The technique is known as "sun gazing," or "sun eating," and it dates back more than 2,000 years to ancient India. By staring at the sun for short intervals every day, at specified times throughout the day, claim advocates, sun gazers are imparted with the universal energy force that drives all life. "Eating" the sun, in other words, is said to literally infuse energy into cells throughout the body. 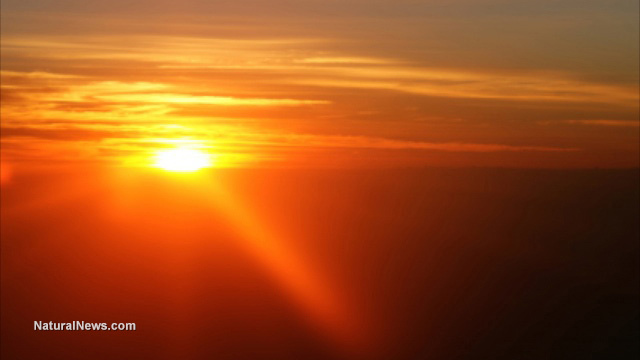 "Sun gazing, a practice also known as sun eating, is a strict regimen of gradually allowing sunlight into your eyes at specific periods of the day," explains Earth Clinic "The goal when implementing the practice is to look into the sun at periods of the lowest ultraviolet-index which occur at sunrise and sunset each day." The beneficial effects of this practice can be dramatic depending upon a person's individual health status, with results ranging from reduced pain and improved cognition to physical healing and expanded consciousness. Much of this has to do with the way energy from the sun helps decalcify the pineal gland. Some refer to it as the "seat of the soul" or the body's "third eye" -- the pineal gland, a small, hormone-producing organ located deep within the brain that's responsible for producing melatonin, a derivative of serotonin that regulates the body's wake-sleep schedule, also known as the circadian rhythm. Restful sleep is absolutely vital for health, which means optimal pineal gland function is also essential. 1) Select a safe period of the day (more on this here), either sunrise or sunset, and gaze at the sun for 5-10 seconds. Do this every day for nine months, adding 5-10 seconds to your daily gazing session until you eventually reach a 44-minute maximum gaze session. 2) After reaching the 44-minute maximum gaze session, start to walk barefoot for 45 minutes daily for a full six days, along with your 44-minute sun gazing sessions. 3) After six days, continue to walk barefoot for 45 minutes daily to maintain what you've achieved.